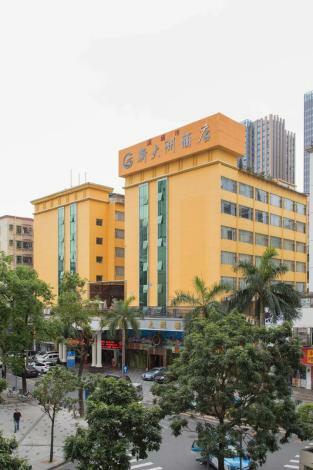 The Shenzhen Xindazhou Hotel (Xindazhou Jiudian) is a business located in the commercial and financial center of Futian District within easy reach of Huanggang Port and the Exhibition Center. Shekou and Luohu Ports are just 15 minutes away and the aiport 30 minutes by car. This Shenzhen hotel has all kinds of deluxe rooms ranging from presidential suites to standard rooms which are all equipped with air-conditioners, satellite TVs, safes, hair dryers, mini-bars, international direct-dial phones, and broadband internet access. - 6.4 km to Huaqiangbei .